Last summer I took swimming lessons in hopes of feeling confident enough to get scuba certified, but observing the dive instructors on the ship, I knew it would have been too much for me. The ship was a “speed catamaran” with “state-of-the-art computerized ride control systems.” This meant we got out to the reef faster, with less choppiness, and for that I was grateful. 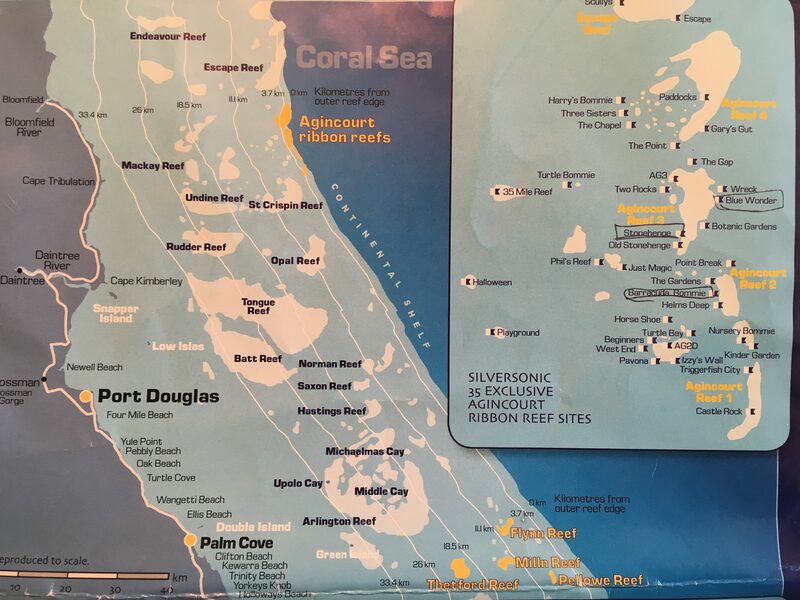 It still took an hour to reach the reef, and one hour of seasickness would have felt like eternity. The dive instructors had convened the tourists who would scuba in the front of the ship. Most of them weren’t certified—they would get one hour of instruction and dive with the instructors. They aren’t starving anymore. All the divers were young Chinese. The base tour wasn’t cheap—$176 US—and they would pay extra for each dive. The instructors were hunky, sun-browned he-men. They demonstrated scuba hand signals, “This means low on air,” said one as he held his fist to his chest, “and this means out of air,” as he slashed his hand across his throat. Suddenly a crew member yelled, “Dolphins!” and everyone rushed to look. Dolphins indeed! There were a dozen cavorting in our wake, and when a crew member went out on a wave runner they jumped for joy around him. It was absolutely delightful. Everyone around me was taking photos and video but I desisted. There was no internet out here, and I had decided to leave my phone wrapped in a plastic bag with a small amount of cash and my Minnesota driver’s license. For all I knew my passport had been stolen. Maybe Aussies weren’t as honest as I’d thought. Would someone pay $176 to spend the day on a ship and pickpocket their fellow passengers? Probably not, but I wasn’t going to leave my phone in the open. I took two photos of the sea all day, at our first stop. Then I decided to just enjoy and not try to capture it. We snorkeled and dived for an hour at a site called Stonehenge, where rock formations jutted from the ocean. I understand the naming system, but Stonehenge is part of Agincourt Reef 3. The ship stopped at three sites out of 35 in the vicinity, depending on weather conditions. The fish were astounding. There were angel fish with yellow, blue, and white vertical stripes and yellow tails and beaks. Whatever kind of fish Nemo the cartoon is, it was there. I glanced down and make a muffled exclamation into my mask, “Giant clam!” My dad had played Giant Clam with us when we were little—sitting akimbo on the floor and pretending to eat us—the little fish. Giant clams really are giant—maybe four feet across. When I am fortunate enough to be in an environment like this, I feel a peace and oneness with everything. I don’t believe in god but I do believe in heaven-like places and states of mind, and this was one. The horn sounded and we exited the water for lunch. 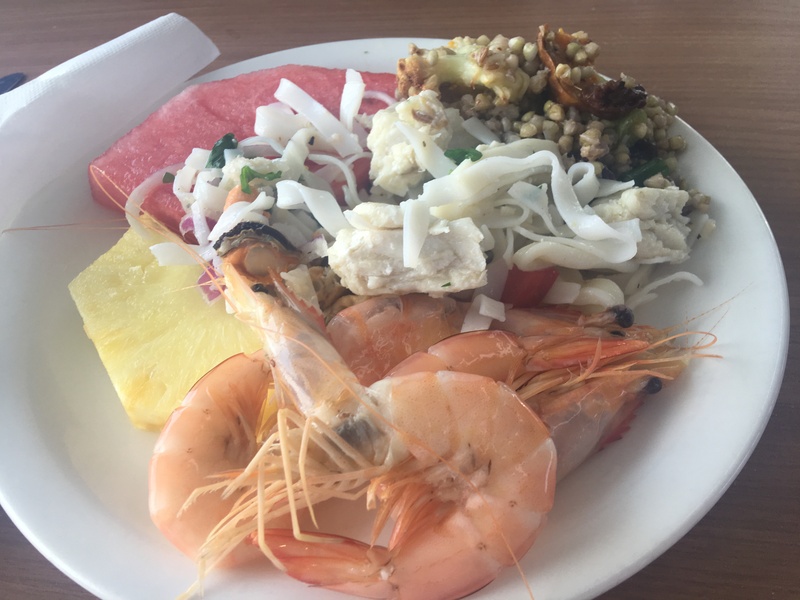 There was an enormous buffet with fresh seafood, fruits and veg, and healthy hearty salads. As I ate, three women in the adjacent booth invited me to join them. They were Lebanese-Australians from Melbourne. They appeared to be my age but they all rocked bikinis. Was it their Lebanese skin they should thank for their faces being without a wrinkle? They were well-educated, smart and funny world travelers who were very kind to invite me to join them. After lunch we stopped at Barracuda Bommie. A bommie is an underwater tower. I floated face down, mesmerized as I watched thousands of barracudas swirl around the bommie—down, down, down into the darkness until I couldn’t see anymore. Why do scenes like this bring on such a feeling of peace, at least for me? Perhaps because it’s so humbling. I realize how vulnerable I am, and how insignificant. At our last stop—Blue Wonder—the sea began to swell and I hit a wall of exhaustion and nausea. 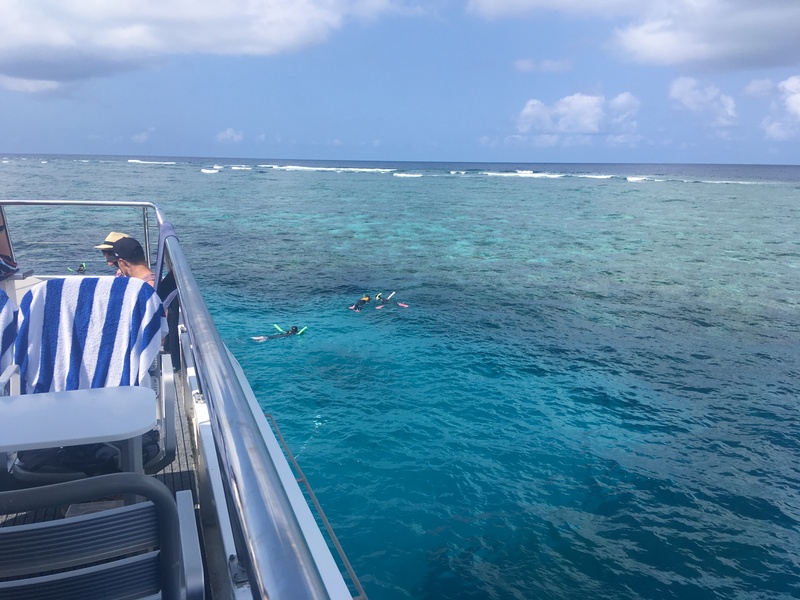 This entry was posted in Adventure, Budget travel, class divide, Culture shock, Joie de vivre, Travel and tagged Australia, Great Barrier Reef, Mindfulness, Scuba Diving, Snorkeling on February 2, 2019 by Breaking Free. 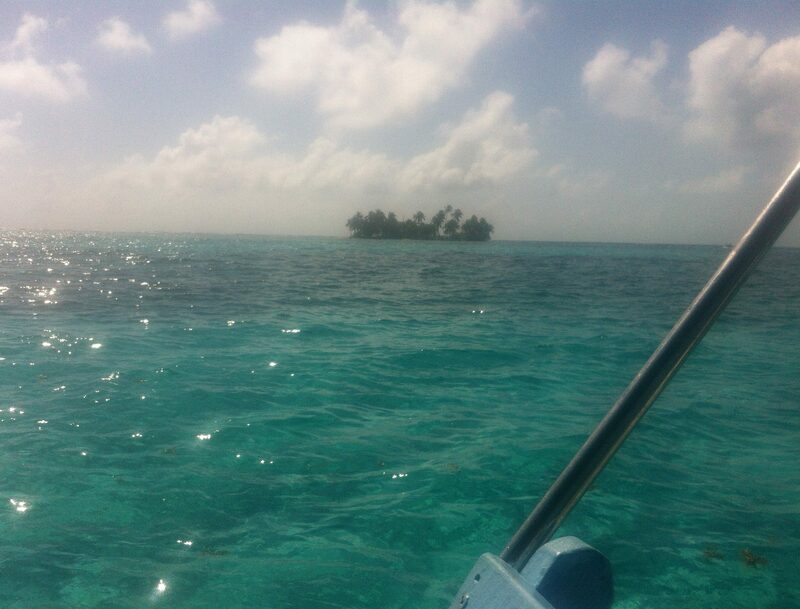 This is a series of posts about Belize that starts here. We sat in the sand under a shade tree enjoying our lunch break before more snorkeling. Here’s something I never knew about snorkeling: it is very dehydrating. There are lots of articles about it; it’s something about the lack of gravity when you’re in the water, apparently. Whatever the case, the public toilet on the island was half a mile off, so we all started pretending we couldn’t get enough of the water, wading in and saying things like, “Ooh, I just can’t stay away from of this beautiful water!” What else could we do? Emily and I had become pals. We had both lived and worked or gone to school in other countries. We lived in the same neighborhood now. And we had both been observing the martyrdom, endless list of food restrictions, and other “interesting” behavior of our fellow tour members. “Do you have any gluten-free options?” asked Joan as the pulled-pork sandwiches were being handed out. Lincoln, our boat captain, smiled and shook his head no. Joan sat back in the shade, her arm still in a makeshift sling from her fall the first day. She didn’t say, “I’ll just go hungry then,” but she didn’t need to; it was all in her body language. Neither she nor Liz had gone in the water. This wasn’t surprising about Joan, who was stick-thin and sickly looking and had fibromyalgia. But Liz was in good shape. “Ah just didn’t feel lahk it,” she drawled. If she was hoping we would ask her to explain why, she was disappointed. The rest of us really couldn’t wait to get back in. As we were putt-putting out to the reef area, I spoke with Vanessa, our guide. Vanessa had finished two years of college to become an English teacher. Then she got this summer job as a snorkeling guide and she never went back. I can’t say I blame her. 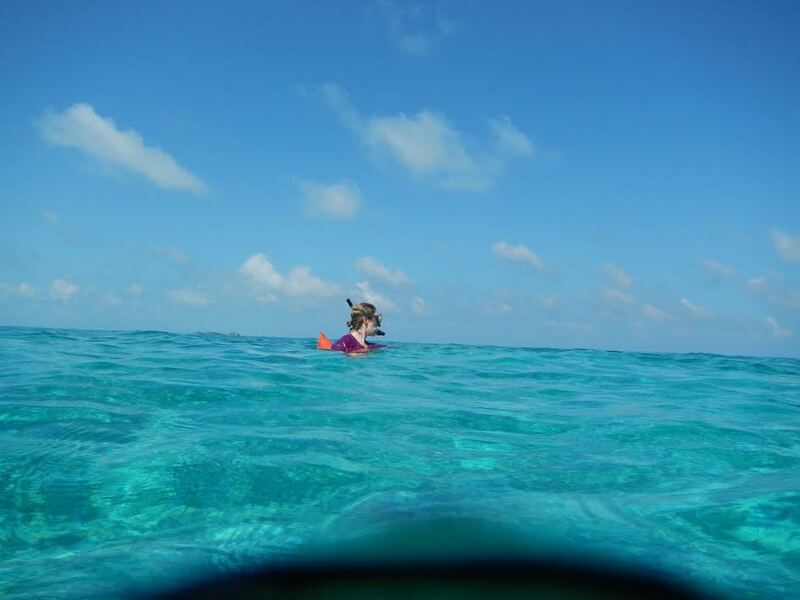 When she said she missed writing, I suggested she could write a blog about snorkeling and she liked that idea. I hope she does it. 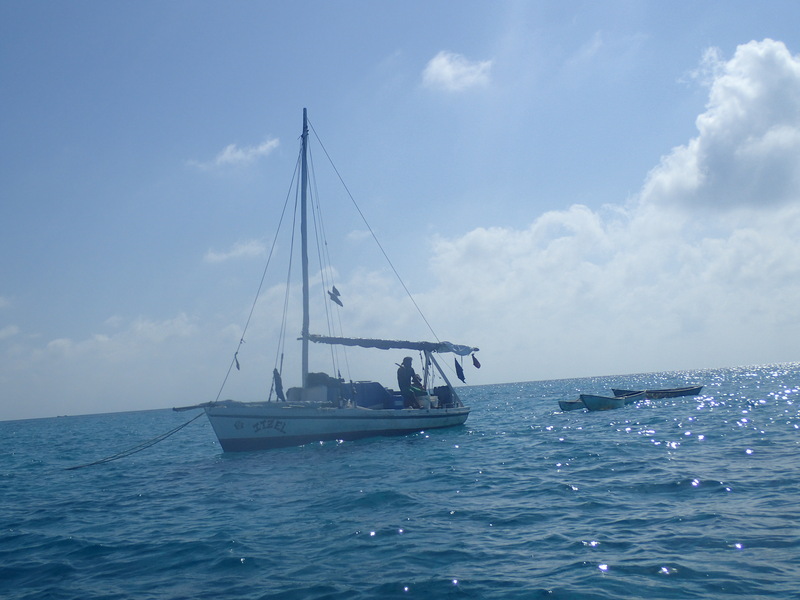 We approached a boat where fishermen were cleaning their catch of conches and throwing the leftover scraps into the sea. 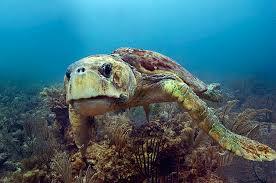 And it was a turtle, an old Loggerhead about five feet from snout to tail. This is not “our” turtle but it’ll give you an idea of what she looked like. 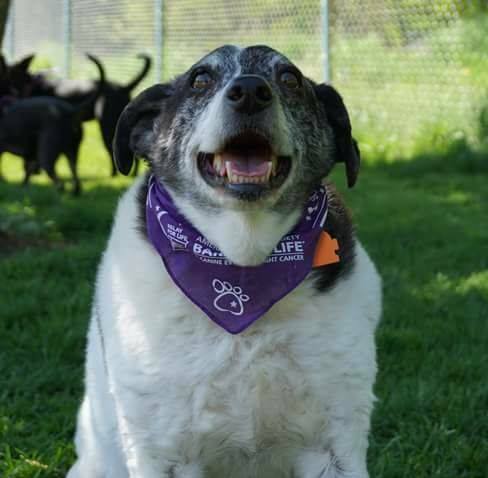 She reminded me of my son’s ancient dinosaur-like dog, Willie, without the purple bandana. 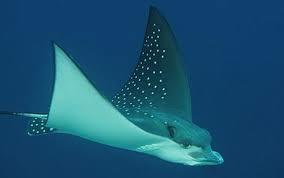 Then there were the rays—Eagle rays and Spotted Rays—also as long as I was tall, also prehistoric looking, also a photo stolen off the web. I wish I could say I took these photos, but as you know if you’ve been reading this blog for a while, I take terrible photos above water, never mind below water. But other people in my group had Go-Pros and water proof cameras. Lincoln and Vanessa kept calling out, “Over here! There’s a lobster / Garfish / Lionfish / Clownfish! Everyone would swim after them to have a look. Everyone but me. I reached an area where the sea floor must have been 30 feet below me but the water was so clear it felt like I was suspended in air. Suddenly I felt panic that I would plummet to the bottom. That passed and I just floated meditatively. Doing nothing, going nowhere. No To-Do list. I caught myself thinking, “I can’t wait to do this again!” then laughed at myself and focused on the fact that I was there, in heaven, right now. The meditative mood stayed with me for the rest of the evening. Walking back to Jeanie’s, we were passed by a teenage boy on a tuk tuk—a motor scooter—with a fat baby balanced on the handle bars. The baby was laughing with delight as the scooter bucked up and down over the potholes. I vowed to be more like a baby—unafraid, in the moment, joyful. 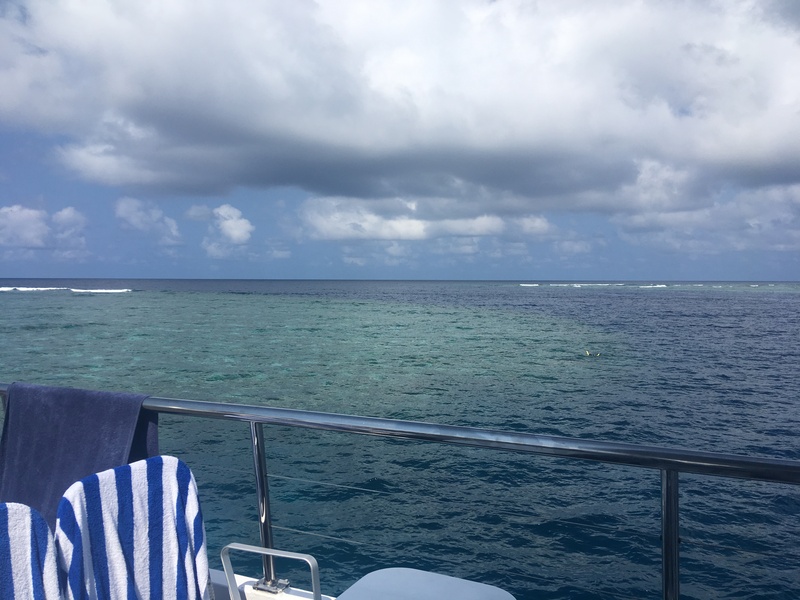 This entry was posted in Adventure, Budget travel, Culture shock, International Development, Joie de vivre, Travel and tagged Belize, Mindfulness, Snorkeling, travel on May 22, 2017 by Breaking Free. The gang returned from watching Scarlet Macaws. None had been exsanguinated by crocodile syndrome. That was good. Much as some of them irritated me, I wouldn’t want anyone to go that way. I was sitting in the lodge having a beer when they pulled up in the van. I had chosen to ignore him rather than say anything. Joan, his wife, rolled her eyes at me when he said these things. He wasn’t a creeper, he was just a clueless, harmless dork. They ordered drinks and sat around talking about their day. They had seen lots of birds, including Scarlet Macaws. The sun set and it was time to head to a local restaurant for dinner. Mark drove the van while most of us walked so we wouldn’t have our digestive systems jostled. The specialty of the house was hudutu, a fish stew made with coconut milk which sounded delicious but which took an hour to appear and had so many bones you couldn’t really appreciate it. It was served with the bread that came with every meal—something like Native American fry bread. It was okay. Walking back to Jungle Jeanie’s, Mike pointed at a grove of tall slender plants and wondered what they were. “I think it’s sugar cane,” I said. “No, it’s not, he said. We returned to our respective huts. In ours, a twin bed had appeared in the middle of the room on the first level. “I don’t care who gets it,” said Liz. I wasn’t going to play the “I don’t care but I really do” game. Snorkeling was the agenda for the whole Day Six. I wasn’t really up for it; I get claustrophobic and I don’t know how to swim. I seriously considered having another day of nothing on the beach. But I went, and it was the best day yet. Maybe the best day of my life. Our guide suggested I wear a life preserver around my waist so I wouldn’t have to even think about staying afloat. I had no pride around that; it was a great idea. I donned the snorkel and mask, sat on the sand in the shallow water, and tried to put my face underwater. Once, twice, three times—I couldn’t do it. This felt like a matter of pride. I was going to at least get my face underwater once. I finally did, and was instantly hooked. How to describe it? 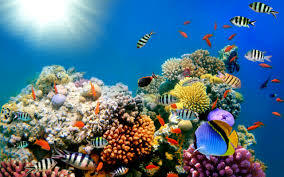 I floated near the water’s surface and gazed at hundreds of species of fish and coral. All colors, all shapes, large and small. The water was warm and clear as air. It was like flying, like flying in a dream. I couldn’t help exclaiming, “Wow! I see a clown fish!” except it sounded like “Waaaahhhh, aslubbba blabba blish!” Then I laughed, which also sounded funny and made me laugh more. No one could hear me. It was one of the rare times in my life that I felt childlike wonder and playful joy. 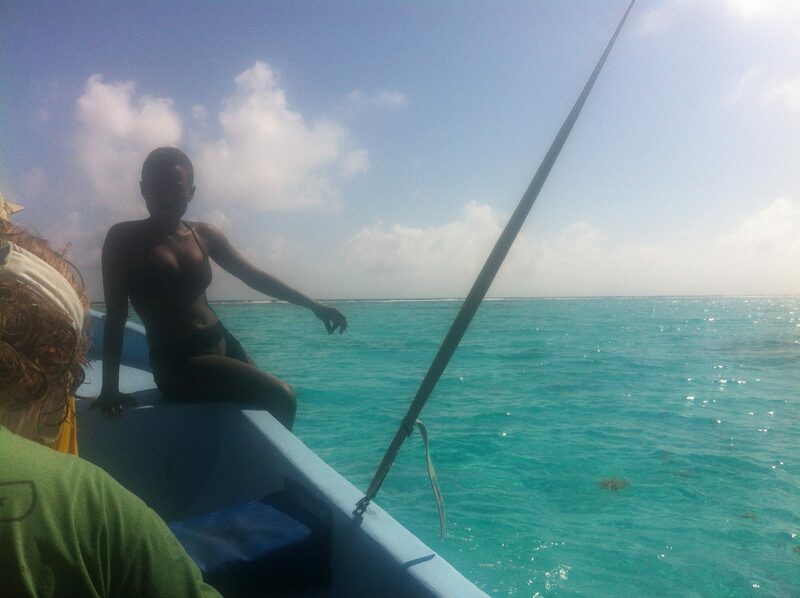 We snorkeled for hours, then they rounded us up for lunch on a small island with million dollar homes. We sat on the beach and munched on our pulled pork sandwiches. Emily, being married to a Muslim, didn’t eat pork either, so the guides gave us their BBQ chicken sandwiches and we were all happy. 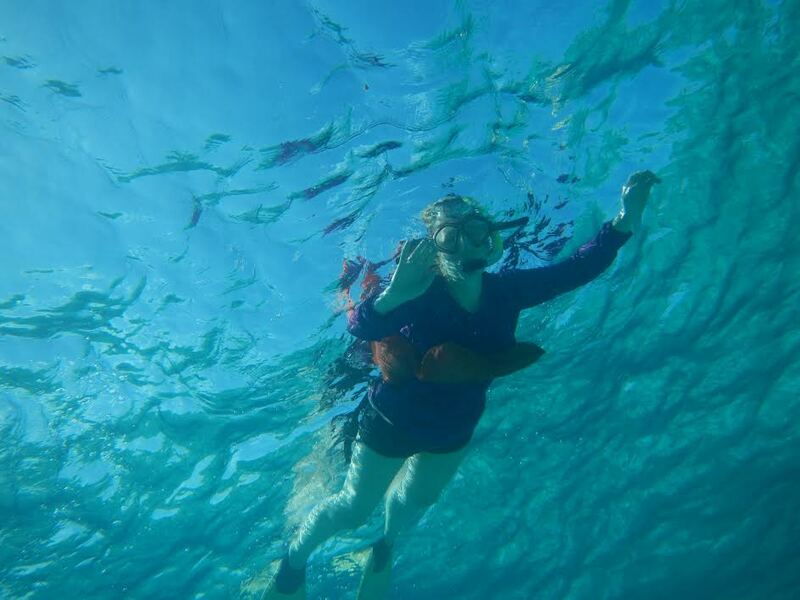 This entry was posted in Adventure, Budget travel, Culture shock, International Development, Joie de vivre, Travel and tagged Belize, Snorkeling, travel on May 20, 2017 by Breaking Free.